Full color vinyl banners - BIG visual impact at an affordable price! 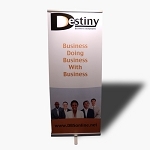 Retractable banners stands, x-back banner stands and much more! We are metro Detroit Michigan based and offer a FREE local delivery zone and FedEx shipping on all other orders. We do printing for customers all over the Metro Detroit area: from Royal Oak, Berkley, Clawson, Troy and Ferndale to Downtown Detroit, Warren, Roseville, Sterling Heights, Grosse Pointe, St. Clair Shores, Southfield and Dearborn and everywhere in between. Keep your business in our great state of Michigan! For our out of town/state customers, we ship via FedEx. Vinyl banner printing in Metro Detroit, Michigan Full color vinyl banner with retractable banner stand or x-back banner stands. Perfect for seminars, meeting or trade shows! Both choices also come with there own carrying case for ultimate convenience when traveling. Vinyl banner printing in Metro Detroit, Michigan Full Color Vinyl banners are a high impact and attention grabbing advertising tool and is proven to demand attention and drive more traffic. All banners are printed digitally in full color allowing you to include photos, color text, color logo and any designs. Vinyl banners are Custom printed banners in full color on Outdoor durable 13 oz scrim vinyl banner material, direct from your custom design art file. We offer large selection of standard banner sizes.